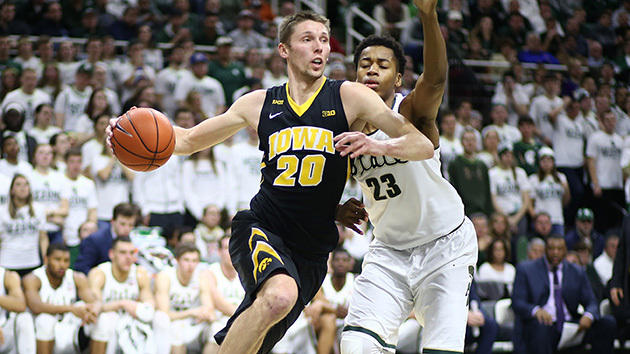 Everything you need to know about the Iowa Hawkeyes as they begin the NCAA tournament. The Case For: This team is loaded with experience, starting four seniors and a junior. Two of those starters, Uthoff and junior guard Peter Jok, are fearsome scorers who should be able to find their shots at any interval. The 6'9" Uthoff can hurt teams at all levels: He shoots 48.3% from two-point range and 39.2% from beyond the three-point line, hoisting 5.1 bombs per night on average. Iowa can work him in the post, on the wing or coming off screens on the perimeter, finding a mismatch no matter how opponents decide to guard him. The 6'6" Jok is a little more dangerous from long distance—41.2% on the year—and he appeared to snap out of a mini-funk during the Big Ten tournament with a 29-point detonation in a pre-quarterfinal loss to Illinois. (Jok had only scored 30 points, total, in the previous three games.) It can’t be a two-man show, naturally, but in tight situations the Hawkeyes should have two tested options for getting needed buckets. And Iowa’s ceiling remains high. This is still a team that drubbed Wichita State and swept both Purdue and Michigan State during the Big Ten regular season. It has the capability to beat nearly anyone in its path. The Case Against: The Hawkeyes currently appear to be a wreck. They lost six of their last eight games, getting bounced from the Big Ten tournament by an Illinois team that came in with a 14–18 record. They don’t at all resemble the efficient, confident club that rose as high as No. 4 in the national polls thanks to a 19–4 start that included winning 10 of its first 11 league games. In those last eight games, Iowa shot 45% or better from the floor just twice. And as potent as Uthoff and Jok are, they must have consistent help. Point guard Mike Gesell reached double figures in just two of his last 11 games and center Adam Woodbury hasn’t scored more than nine points in a game since Feb. 11. Iowa needs greater balance to achieve anything and it is not getting that balance regularly enough. And then there is the not-so-small matter of bad memories. In 2013–14, Iowa started 19–6 ... and finished 1–5, losing its NCAA tournament play-in game in Dayton. Coaches and players insisted after the Big Ten tournament debacle against Illinois that this team is different, but the Hawkeyes went from a likely No. 1 seed playing in comfy Des Moines to a total mystery, over the course of a month. How will they react to tournament adversity?